Marquette women’s basketball coach Carolyn Kieger had seen this before. More specifically: she’d lived it before. When she took over the Golden Eagles program in the summer of 2014, she was replacing a coach — Terri Mitchell — who had guided the program to 348 wins over the previous 18 years, including the 2008 WNIT championship. But it was a program in transition, which is how Kieger inherited it more than four years ago. Marquette won just nine games in Kieger’s first season, in 2014-15. The next year, competing with the nation’s youngest team — eight freshmen in all — the Golden Eagles improved to 14 wins. It was in Year 3, the 2016-17 season, when the big breakthrough came, when Marquette won the Big East and advanced to its first NCAA tournament since 2011. So when Marquette faced Montana last November in Cancun, Kieger, then in her fourth season, saw in the Lady Griz a team that was making its way down the same path her program had recently taken. Shannon Schweyen had replaced Robin Selvig in the summer of 2016 and due to graduation and injuries had been forced to play a young lineup that first year, which resulted in a seven-win season. Kieger and Marquette faced Montana in Year 2, when those young players were a year older but still not quite ready for the big time. The Golden Eagles raced out to a 20-point halftime lead last November in Mexico. Perhaps a year earlier that would have repeated in the second half, with Marquette winning by 40, as South Dakota State had done in Schweyen’s second game as coach. Instead, Montana outscored Marquette by one over the final 20 minutes. It probably went unnoticed because the final score, 87-68, looked so lopsided, but it was a big moment for those inside the program. Montana played even with a team that would make it to the second round of the NCAA Tournament in March. That made Montana 0-5 on the season, but the Lady Griz would win 12 of their next 17 games. The program was evolving before our eyes, returning to what it had been. “She said we reminded her so much of what they were,” Schweyen, now in her third year, recalls. “She said they had a group of freshmen who came in and had to play, and it was tough that first year. Montana’s first two seasons under Schweyen were largely defined by injury, specifically those to Kayleigh Valley, voted the preseason Big Sky MVP in both 2016-17 and last season, and Alycia (Sims) Harris. But they were also defined by what took place in the wake of those injuries. The team’s top five scorers in Schweyen’s first year were either true or redshirt freshmen. A year more experienced last winter, Montana, with mostly the same players, doubled its wins total from seven to 14 and started doing things the team the year before had been unable to accomplish. Defending the home court. Playing well on the road. Defending in general. Now that core group, with just a single senior on the roster in Jace Henderson, is back, ready to take it one (or more) step further when the Lady Griz open practice on Thursday morning. “I feel like this is hopefully the season when all the trials and tribulations that this group has been through together is going to pay off,” said Schweyen. “They were thrown into things and suffered through a lot, then really grew a lot as sophomores and had some success together. Montana returns all five starters from a team that peaked in late January, when the Lady Griz went on the road and swept Southern Utah and Northern Arizona in convincing fashion. That the team’s high point last season came in January and not March can be attributed to another injury, this one to then freshman Sophia Stiles, who became a player in full on that road trip, scoring 26 points on just 11 shots at SUU and sparking Montana to a big early lead at NAU. After a close home loss to Northern Colorado, which won both the regular-season and tournament titles last season, Stiles was lost for the remainder of the season in the team’s home win over North Dakota in early February. It just wasn’t the same after that. And it provides the primary storyline for the team as practice opens. The nine-month mark of her recovery will arrive in early November, and it probably won’t be until that time that a decision will be able to be made about the timing or status of her return. Montana’s final nine opponents of the year — the Lady Griz closed the season going 2-7 after Stiles’ injury — averaged more than 74 points per game against Montana, and a lot of that firepower came from the perimeter, which is where Stiles did her best work. Those nine opponents made more than 10 3-pointers per game on nearly 40 percent shooting from the arc. “Her defense made us a better team,” said Schweyen. “There are a lot of really talented guards in the league, so we certainly missed having her defense on the perimeter. We had a hard time guarding people after she went down. With Stiles or without her in the early part of the season, Montana will be in good hands, and that starts at the point, where fourth-year junior McKenzie Johnston returns after an honorable mention All-Big Sky sophomore season. Johnston led the team in scoring (12.5/g) last season and came within one dime of leading the Big Sky in assists, pretty good for someone whose teammates shot 39.2 percent from the floor, less than 27 percent from the 3-point line. Had Montana shot better as a team, Johnston would have led the Big Sky in assists by probably 50 or more. “That she was one assist from leading the league on a team that had no other all-conference players around her speaks volumes to the kind of player she is,” said Schweyen. She also became a more consistent scorer last winter and can produce from the arc on in, because who hasn’t enjoyed Johnston posting up her defender and schooling that player for two points around the basket, often with some sort of spin shot that appears to defy physics. The team’s lone senior is Henderson, a forward, who has been on campus so long it feels like she’s spent half of her life in Missoula competing for the Grizzlies. Some perspective: She played for the Montana volleyball team in the fall of 2014, back when Jerry Wagner was the coach of that program, which feels like a decade ago. She switched sports and has slowly made herself into one of the better post players in the Big Sky Conference. She had five double-doubles last season and ended the year averaging 8.8 points and 7.2 rebounds while shooting 47.4 percent. But that’s numbers-based information. Where Henderson really excels is the other stuff. “I don’t think you could be less worried about leadership than we are,” said Schweyen. “Jace is everything you’d want in a senior. If there is an X factor on the team, or the player who might be the one to really get this thing rolling, it’s redshirt junior Taylor Goligoski, who led the team in scoring as a freshman, then had a drop-off as a sophomore thanks to a season-long cold shooting hand. She pictures herself as one of the best shooters in the Big Sky, but her 28-percent performance from the arc a year ago suggested otherwise. So she did what she’s always done. She got to work. If anyone made frequent stops to the Adams Center over the summer, there was a consistent recurrence they would have gotten used to seeing: Goligoski, in sweat-soaked t-shirt, heading out of the building after another workout. The team’s other returning starter, junior Madi Schoening, averaged 8.7 points and 4.5 rebounds per game last season, despite performing with a body that was fighting its own, non-basketball, battle. That Schoening played as well as she did is a credit to her toughness and perseverance, and it’s probably worthy of a story all its own. So let’s do it. Look for it on Thursday. If the Stiles question gets answered, there is still a big one hanging out there: After the five starters, who’s left? Because there was a lot of turnover after the season. There are two knowns on the rest of the roster. Junior Emma Stockholm, she of the 6-foot-2 frame but 3-point shooter’s mentality, is back, as is third-year sophomore Gabi Harrington, who took the unusual route of playing as a true freshman, then redshirting her second year. Lady Griz fans everywhere will be glad she did, because she’s going to be the all-around difference-maker — think: both ends of the court — that she wasn’t able to be in 2016-17. And everyone will welcome back the team’s sweetest shooting stroke, blessed as it was by the game’s deities. The players who departed the program, either through graduation or other reason, are all recognizable but one will be felt more than the others, maybe combined: Caitlin Lonergan. She joined the program in the spring semester of 2017 as a transfer from Montana State and practiced with the team for nearly a full calendar year before being declared eligible in late December. And she was a revelation. Everything that Schweyen had said she was seeing behind closed doors was unleashed on an unsuspecting Big Sky. Because there are not many players like her, especially in this league, with that kind of size and strength. It was still raw. That’s the most disappointing thing about her going all in on her academics. All we saw was the surface being scratched. In the 19 games she played, she averaged 10.5 points on 51.4 percent shooting and 5.5 rebounds, and she was at her best at the end, scoring 18 points on 9-of-12 shooting in a Big Sky tournament win over Sacramento State, then adding 18 more in a quarterfinals loss to Northern Colorado. Here is the one thing that was forgotten about Reno: no team gave the Bears more fits on their way to the tournament title than Montana, which fell into a big hole thanks to UNC’s early barrage of 3-pointers but still fought back to within seven points in the fourth quarter. The Bears had no answer for Montana’s bigs. In a league that is trending more and more toward guard play and the 3-point shot, it revealed that size can still win, which would have been the case this winter, with Lonergan joining Henderson and Abby Anderson, a Carly Selvig-copy who redshirted last season. With so many players going out, so many players had to come in. There is the transfer — Sammy Fatkin, who played last winter at Arizona — and the walk-on who spent her freshman year at Montana on the Griz track and field team — Lee Camel of Ronan — and four true freshmen. Fatkin, a good-sized guard, is going to be fantastic. You just won’t be able to see it for another year. Transfer rules dictate she has to sit out the 2018-19 season. “We’re excited to have her experience,” said Schweyen. “She is going to be great for practice this year. She’s going to be one of those kids who makes practice her games, and that is going to make us better. Schweyen and her staff brought in a freshman class that’s not only talented, they are used to having success: Kylie Frohlich and Jordyn Schweyen of Missoula and Sentinel High, Carmen Gfeller of Colfax, Wash., and Katie Mayhue of Albany, Ore., a former Pac-12 commit who ended up in Missoula. Not all will play this year but Mayhue should. Combine the term baller with women’s basketball and up should pop a picture of Mayhue, who fittingly wears No. 1. It may have been assigned, but the guess here is it was chosen by a player whose self-belief is only topped by her love of the game. Start your own countdown now: the Maroon and Silver scrimmage will be on Oct. 23. Mayhue will be one to watch. “She plays with a lot of confidence, and I like that,” said Schweyen. There are areas of concern, of course, as there are with any team at this time of year. For Montana those are 3-point shooting and defense. Because for as many gains as the Lady Griz made last season, their performance from the arc ranked well below — actually quite well below — average for the second consecutive year. The team shot 25.7 percent from the arc in Schweyen’s first year. That improved to only 27.5 last season. Montana is always going to run the same sets and plays it has for decades, a system that grew from collaboration over the years between the men’s and women’s basketball coaches and disseminated by a long-limbed coaching tree, but that doesn’t mean the Lady Griz shouldn’t be expected to knock down an open look from the arc now and then. Goligoski, primed for the big year that she is, will help with that, as will the return of Harrington and the addition of Mayhue. There is also the other end of the court, where Montana’s team defense got exposed late last season after Stiles was lost. Teams just had less and less of a hard time scoring on the Lady Griz. Weber State put up 89 at home, Northern Colorado 43 in the first half (on nine made threes) in the Big Sky tournament game that ultimately ended Montana’s season in Reno. “There are some very talented teams in this league, so we’ve got to get better defensively,” said Schweyen. “We need to be hard to score on. When you’re playing younger kids, that’s something that doesn’t always hit home. They won’t have much time to learn, not with the schedule opening as it does. 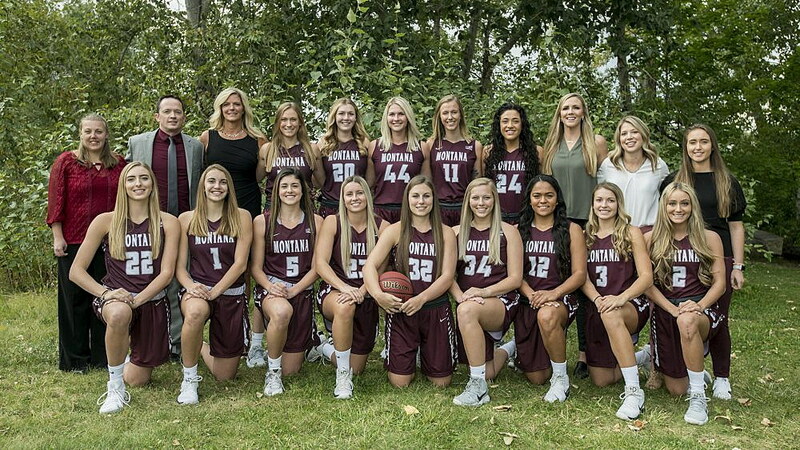 Montana hosts Carroll in an exhibition game on Oct. 30, a team that won 25 games last year without its best player (early teaser: she’s back), and that does not include an exhibition win at Boise State, an NCAA Tournament team. Montana opens the regular season at Gonzaga on Nov. 7, takes a nearly two-week break before playing in front of what will be a full house at Lady Griz School Day on Nov. 20 against Providence, then has a must-see home matchup against South Dakota, one of the best teams around you’ve never heard of. All the Coyotes did last winter was win 29 games and go a perfect 14-0 in the Summit League, with a regular-season sweep of South Dakota State, one of the best teams around you’ve heard of. And that gets the team to December, which features a tough field at the Lady Griz Classic and road games against a pair of Pac-12 opponents in Arizona and Washington. All of which sets things up for the 20-game Big Sky Conference schedule, with all roads now pointed toward Boise in early March instead of Reno. Only time will tell if Carolyn Kieger was spot on, that the breakthrough is coming. And coming soon.